Non-governmental organizations (NGOs) can serve an important role in the international system, providing valuable humanitarian assistance, including health services, education, and other basic requirements. They can also play a beneficial role in developing civil society, democracy, environmental protection, and human rights. Furthermore, in the midst of violent conflict, NGOs can promote dialogue, and the principles of non-violence, tolerance, and reconciliation. Unfortunately, however, NGO activity can also be counterproductive – particularly in an environment of intense conflict or ethnic strife. In such situations, NGOs and their leaders can even become part of the problem, and serve to increase conflict. The negative impact is exacerbated by a lack of oversight, transparency, and critical analysis of NGO activities. Unlike democratically elected governments or publicly traded companies, no systematic framework exists for holding NGOs to standards of accountability. NGOs that claim to pursue “universal human rights” often enjoy immunity from detailed scrutiny or criticism. The vast resources at their disposal allow for large staffs that produce an immense volume of reports, press releases, and media interviews, turning them into primary sources for journalists, researchers, and government policy makers. The amplifying effect of these public pronouncements has often framed the terms of public discourse and strongly influences the crafting of policy. NGOs are in a dominant position, providing the supply to meet the demand for quick and focused information. However, as NGO Monitor1– a project of the Amuta for NGO Responsibility – and others have documented, established human rights NGOs often produce reports and launch campaigns that stand in sharp contradiction to their own mission statements. They regularly obscure or remove necessary context, provide incomplete statistics and images, and disseminate gross distortions of the humanitarian and human rights dimensions. What is more, NGOs often receive a large portion of their funding from government donors – rendering their definition as “non-governmental” organizations highly questionable. Due to their reliance on donors for their survival, NGOs must also be considered as self-interested organizations seeking to please donors in order to secure future grants. This self-interest can impinge upon an NGO’s moral compass, and lead to NGO focus on short-term driven work, rather than long-term results that benefit the public as a whole. NGOs are granted significant leeway in exercising their influence, as they are automatically perceived as serving the “public good” due to their non-profit status (“Halo Effect”). However, while NGOs do not officially pursue material gains, though several NGO officials are highly compensated and enjoy tremendous prestige and perks,2 they do not necessarily reflect public opinion or public interest. Yet, NGOs are highly involved in lobbying and shaping public policy and are recipients of significant amounts of taxpayer funding, but are neither accountable to voters nor subject to scrutiny. The direct outcome of this undemocratic process is less good governance – less transparency, counterproductive policy-making, and misuse and waste of public funds. The UN also plays a key role in the issue of civil society space. The ability for NGOs to obtain prestigious ECOSOC status and participate in UN frameworks, provides these organizations with additional legitimacy and perceived credibility. In addition, various UN bodies, including the United Nations Office for the Coordination of Humanitarian Affairs facilitate the transfer of billions of dollars to NGOs. It is, therefore, in the UN’s interest to address the issues of good governance, transparency, accountability, and anti-discrimination related to NGOs. Providing guidance will assist member states in crafting domestic regulations. Similarly, best practices can help the UN in fulfilling its objectives, increase aid effectiveness, and exhibit the good governance it recommends to others. The following submission will briefly address current issues regarding civil society space, focusing on the need for focused and targeted domestic regulation and greater transparency in UN frameworks, commandeering of aid in conflict zones, and abuse of human right appellations such as the “human rights defenders” (HRDs) designation. We welcome the opportunity to discuss these issues in greater depth with Office of the High Commissioner for Human Rights. In recent years, international bodies, including the OHCHR, have expressed concern over state regulations of NGOs, suggesting that such initiatives may infringe on the freedom of civil society. In some cases, this critique is accurate. In other cases, however, this view negates the reality that governments must balance the rights of NGOs with other rights and considerations and that such balancing often requires regulations or limitations. It is also important to note that it is a fallacy that increased transparency inherently impinges on the freedom of NGOs. Such arguments are often advanced by entities seeking to operate outside of public scrutiny. The general public, therefore, is entitled to expect heightened transparency for organizations that receive special tax privileges from authorities in keeping with the OECD’s position that governments must publicly justify decisions to forgo tax revenue. Financial transparency requirements for NGOs represent a tool for combatting corruption and abuse of tax benefits. Exempting civil society groups from transparency regulations has the effect of creating double standards over the proper scrutiny of public funds. The threat of manipulation and abuse of these bodies is also decreased by financial oversight. As a result, regulations designed to promote transparency are appropriate and necessary. Another primary concern is the financing of political actors and campaigns. For foreign actors working to promote political, economic, or social agendas in other countries, NGOs represent one vehicle for importing their ideas and influence into the political sphere. Often this non-democratic activity takes place in secret. Transparency regulations are often employed to provide information to the public regarding the identity of and to what extent outside bodies are financing political activity. In this regard, funding transparency requirements for political organizations are similar to financial reporting legislation for political candidates, lobbyists, and campaigns that exist in nearly all modern democracies. The nature of the relationship between the UN, other international institutions, governments, and NGOs has attracted the attention of scholars, policy experts, and decision-makers, with many expressing serious concerns over issues of transparency, access, and due diligence. The Amuta has conducted extensive research on the role of NGOs within UN frameworks and the implications for civil society space. Access is a critical issue for NGOs and their ability to participate at the UN. First, the ECOSOC accreditation process requires greater transparency and checks to prevent certain member states from delaying or blocking NGOs solely on political considerations, most notably those NGOs that might serve as a critical voice to dominant blocks at the UN. At the same time, ECOSOC has also granted accreditation to organizations that have potential links to designated terror groups or other groups endorsing violence. Proper regulations must be enacted to prevent abuse of the accreditation process by these actors. The issue of access goes beyond accreditation by ECOSOC, however. Specifically, certain NGOs receive additional benefits including extensive publicity and promotion for the reports, publications, and activities of selected NGOs. These benefits include the promotion of NGO websites by OHCHR and the dissemination of NGO publications by ReliefWeb. No criteria or standards are published regarding eligibility or as to how NGOs are selected for these benefits. Often, such as in the case of ReliefWeb, it appears that these decisions are made at the personal discretion of UN officials. NGOs also feature prominently in UN reports and conferences. Often, these NGOs comprise a small, select group, representing an extremely narrow political viewpoint. Yet, again, there are no guidelines or standards published as to how NGOs are consulted by UN bodies. OHCHR and other bodies must expand their partnerships with a broad range of NGOs to include a variety of viewpoints and actors. In light of these issues, OHCHR and other UN bodies should work to craft transparency and accountability systems to ensure that the public can independently evaluate the effectiveness of UN funding and activities. Despite good intentions on the part of civil society, NGO aid and humanitarian services are at risk of being diverted to terror and other violent causes when these groups operate in conflict zones. Given these challenges, it is not a limitation per se of civil society space when governments seek to implement reasonable regulations and guidelines to prevent this activity. The case of Gaza is instructive. A vast majority of humanitarian projects implemented by NGOs and aid agencies in Gaza are funded by governmental, inter-governmental, and UN bodies. As such, these donors could impose restrictions on the use of taxpayer funds, as well as demand that implementing organizations abide by standards, best practices, vetting and evaluation procedures, and other anti-terror and security measures, to guarantee that projects do not violate legal and moral principles. Since 2010, more than 25 percent of all aid projects in Gaza have been implemented by UNDP. UNDP’s 2012-2014 “Consolidated Plan of Assistance” details its goals for Gaza, but it clearly shows that the organization’s agenda goes far beyond humanitarian assistance. For example, the Plan contains a section dedicated to UNDP assistance for Palestinian diplomacy, such as channeling “key PA messaging to wider audiences” and supporting the “diplomatic corps of the Palestinian Authority in its national and international efforts” in order to “support the Palestinian National Authority… to monitor the implementation of the statehood agenda.” The report also outlines the goal of “supporting the rule of law and access to justice in the Gaza Strip” at a time when Hamas is currently in control of these mechanisms, raising the question regarding the extent of official cooperation with Hamas institutions. When assessing various risk factors that could potentially hinder aid administration, the UNDP plan refers a situation where “import material is tampered with/stolen/misused by contractor.” However, in detailing mitigation measures designed to deal with such a threat, the plan laconically states that “the project is designed to mitigate these risks,” without providing any concrete, practical methods as to how this is so. The document merely proscribes measures to inform stakeholders of the incident in order to prevent the contractor (if at fault) from working on future projects. UNDP does not call for the suspension of the project under these circumstances, as opposed to the recommended response to an Israeli decision to prevent the delivery of aid materials. More troubling is a July 2014 UNDP internal audit, which raises questions regarding the extent UNDP has the capacity to mitigate risks in Gaza. The audit found serious flaws in UNDP administration, including the fact that core aid components were handled by un-authorized contractors. The employment terms of these non-staff members were murky and undefined. The audit also found that UNDP’s internal financial tracking system recorded spending millions of dollars lower than actual levels, which may reflect deliberate tampering as a result of unapproved purchases. Another 40%of aid projects in Gaza since 2010, including the construction of homes, health centers, and schools, have been implemented by UNRWA. UNRWA has been accused of employing Hamas members, a charge that was confirmed when UNRWA Commissioner General Peter Hansen said: “Oh I am sure that there are Hamas members on the UNRWA payroll and I don’t see that as a crime.” Hansen’s statement is actually consistent with UNRWA policy: the group does not screen its employees for membership with Hamas or Hezbollah, as opposed to screening for ties to Al-Qaeda or the Taliban. Despite the various governmental standards and restrictions, many NGOs have no stated policy regarding interaction with Hamas. To a certain extent, NGOs essentially remove a central actor from policy considerations. This also means, however, that NGOs are ignoring, at least publically, the effect Hamas has on the implementation of aid projects in Gaza. The challenge is highlighted in the case of World Vision. In 2015, NGO Monitor recognized that World Vision’s willingness to negotiate and coordinate with armed groups raised questions as to whether the group would prevent components of its aid from being misappropriated by terrorist organizations. Indeed, in August 2016, World Vision’s Manager of Operations in Gaza Mohammad El-Halabi was revealed to be an alleged member of Hamas. He is currently on trial for diverting approximately 60% of World Vision’s Gaza Budget to the terrorist organization to build tunnels and fund other terrorist activity. The alleged siphoned funds amount to approximately $50 million. El-Halabi reportedly hijacked World Vision funds by creating humanitarian projects and fictitious agricultural associations to act as a cover for the transfer of monies and materials to Hamas. El-Halabi had previously worked for the United Nations Development Agency (UNDP). The High Commissioner for Human Rights, various Special Rapporteurs, and many UN reports have lamented attacks on HRDs and the “shrinking space” for their activities, and often name civil society members that have allegedly been targeted for carrying out “human rights” work. 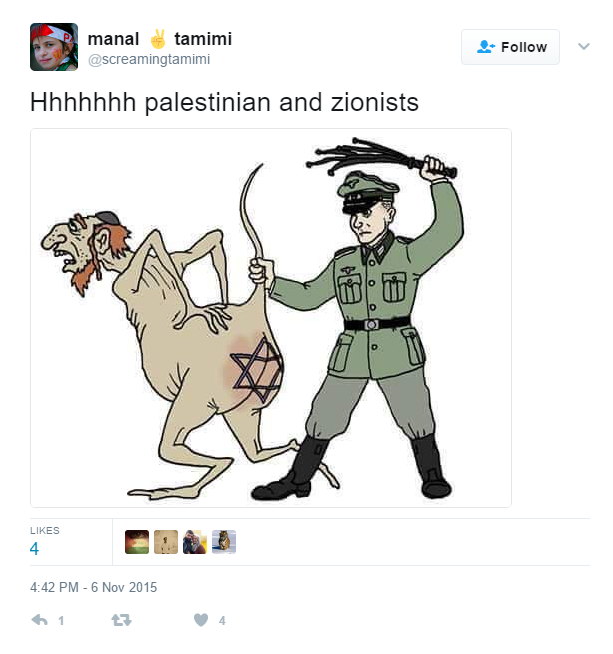 Unfortunately, however, many of the individuals granted the prestigious appellation of HRD by these same UN officials have promoted virulent antisemitism and other forms of bigotry, violence, and incitement. Others are linked to or are members in designated terrorist organizations or have themselves been convicted of crimes. Such individuals cannot be considered as defenders of human rights under any interpretation of the HRD definition. The gratuitous application of this status debases the concept of HRDs and makes it more difficult to provide protection to actual defenders of human rights. On March 29, 2017, the Amuta submitted a complaint, sent to the President of the Human Rights Council and the High Commissioner for Human Rights, against Special Rapporteur Michael Lynk for promoting Tamimi despite her egregious conduct. On May 18, an OHCHR official responded that Tamimi would be removed from the report and on May 9, an edited version of Lynk’s report was posted on the OHCHR website without reference to Tamimi. The abuse of the term HRD by Rapporteur Lynk was not limited to Tamimi, however. His report also granted the title to El-Halabi (as mentioned above, currently on trial for diverting $50 million in humanitarian aid to Hamas), three individuals linked to the PFLP terrorist organization, and several prominent advocates of antisemitic BDS. Several of the names were provided to Lynk by NGOs, many of them also involved in BDS, promotion of antisemitism, and/or linked to terror organizations. Their inclusion suggests that Lynk did not conduct independent research and verification, but rather blindly repeated claims made by these outside organizations. Alternatively and more troublingly, Lynk deliberately ignored their record. Again, had OHCHR and Lynk consulted a wider range of source material and NGOs while preparing his report, they likely would have been alerted to these concerns before the report was issued and avoided considerable embarrassment, wasted time, and resources. The failure to strictly adhere to the HRD definition is not limited to this one incident, but is representative of serious issues found in the reporting processes of OHCHR and other UN frameworks and their relation with civil society. It is critical that OHCHR and the UN adopt guidelines to better define this role and make it more transparent. As discussed, civil society plays an essential role in democratic societies. But like any actor, the rights of NGOs must also be balanced with other sectors of society and public needs. Good governance practices must be applied to all of civil society. Implementing guidelines will increase the efficiency and effectiveness of civil society, expand their ability to operate, and promote the values of the UN. The Amuta for NGO Responsibility stands ready to discuss and advise on these issues with OHCHR. NGO Monitor is a project of the Amuta for NGO Responsibility. Advisory Board members include: Elliott Abrams, Hon. Michael Danby (MP), Prof. Alan Dershowitz, Hon. Alexander Downer, Sen. Linda Frum, Tom Gross, Colonel Richard Kemp, Douglas Murray, Hon. Fiamma Nirenstein, Prof. Judea Pearl, Judge Abraham Sofaer, Dr. Einat Wilf, Prof. Ruth Wisse, and R. James Woolsey. For instance, Kenneth Roth, Executive Director of Human Rights Watch, receives annual compensation of more than $500,000, is a fixture at the Davos Forum, and has attended a State Dinner at the White House honoring Chinese President Hu Jintao. See NGO Monitor, Filling in the Blanks: Documenting Missing Dimensions in UN and NGO Investigations of the Gaza Conflict, for a survey of country and organizational approaches to this issue.